I don't think you can get a more stylish colour combination than black and silver. Monochrome is big this year and is a timeless classic.So, with this in mind I chose a black swarovski 2cmx2cm square to be the main focus of this necklace. 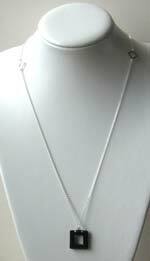 At 32" long the sterling silver chain(shortened for display purposes), with added diamond shaped connectors,will compliment any geometric print outfit you are planning to wear.. If you like classic colours take a look at Edie-Crystal.